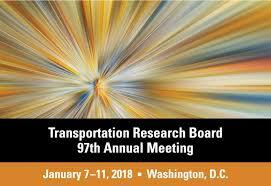 Having recently spent a few days meeting with several thousand of my friends and colleagues in transportation (otherwise known as the Annual Meeting of the Transportation Research Board), I wanted to share a few nuggets of information I picked up. There is a lot of discussion these days in climate change circles about the benefits of “green taxes” (e.g., carbon taxes) for promoting desired behaviors while raising funds for governmental activities. And of course in transportation circles there is always talk about the need for more money. So it is not surprising that people in the overlap of those circles are looking into green taxes for transportation. So, you might ask, what percentage of the American public would support, for instance, a 10-cent increase in the gas tax, with the revenue “dedicated to transportation projects to reduce global warning”? The answer is 54 percent. Despite the noise you hear about Americans hating taxes, the research shows that a majority of Americans support gas tax increases when they are dedicated to transportation goals. The gas tax option gaining the highest support – 78 percent – is for a 10-cent increase with revenue “spent on projects to maintain streets, roads, and highways.” And support for gas tax increases has been generally trending up during the seven years for most of the options presented! Bottom line: There is a broad reservoir of potential public support for “green” taxes that benefit clean transportation. What can state DOTs do to advance decarbonization of the transportation system? First of all, it’s encouraging that this was a prominent topic for discussion, including in a workshop dedicated to it. · The transportation sector is getting increased attention as the electricity generation sector is – in many places – rapidly cleaning up, leaving transportation as the next big challenge. · State DOTs need to move beyond their normal limits, getting involved in areas of the transportation space where they may have no direct jurisdiction but which may be critical for decarbonization efforts. · Many states have adopted a “toolbox” approach to greenhouse gas emissions reductions, but likely the “big two” tools are promoting electric vehicle adoption (or, more precisely, increasing electric vehicle miles traveled – eVMT) and carbon pricing. All the other measures are probably only nibbling at the problem. · And speaking of those toolboxes, how about evaluating how they are working? A number of states adopted climate change action plans or energy master plans about 10 years ago or so. A few have decided (I think it’s a great idea) to go back to those plans and take a look at how many of the proposed measures were actually adopted, how well they worked, and what lessons can be learned for planning the next 10 years. · Minnesotans are becoming very attuned to climate change issues, as the state is experiencing higher temperature increases than any other state. 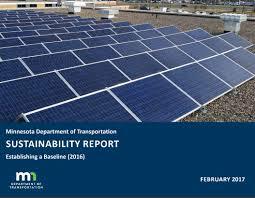 Minnesota DOT has set up a “Sustainable Transportation Steering Committee” that plans to publish an annual scorecard (first edition here) based on targets for reduced greenhouse gas emissions in MnDOT facilities, fleet, highway operations, roadside management, and construction areas. · In Washington State the transportation sector accounts for a whopping 44% of greenhouse gas emissions (a lot of electricity is provided through hydroelectric power), leading WSDOT to keep climate change issues on the front burner. In addition to their well-known commitment to the West Coast Electric Highway (being strengthened through deployment of new Fast Chargers), the agency is funding electric buses, looking into the possibility of electric ferries (! ), operating a new Active Transportation Division, and pursuing a wide range of partnership initiatives with other agencies and local governments. The state already has a carbon cap in place, including transportation, but does not yet have a “trade” or “invest” component to the scheme. · I think most of us would put California in the lead for dealing with transportation decarbonization, as they are in so many spheres. Perhaps their most important initiative right now is the carbon cap-and-invest program, which extends to the transportation sector. But Caltrans is also undertaking a wide range of important activities. To name a few: GHG emissions from department operations have been reduced by 40 in 6 years; $220 million a year is now programmed for Active Transportation(! ); construction and materials (e.g., concrete) are being researched; the highway design manual has been revised to encourage flexilibility for multimodal transportation (called “facilities,” not “amenities”); the new high-speed rail line is planned as the spine of the state’s transportation network. Lots of good stuff! A little good transportation news (or, good transportation news from a little country?)…….. Yes, we could all use some good news. 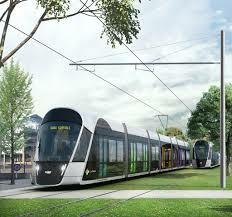 How about a brand-new, spiffy-looking tram in Luxembourg! The new tram – very reminiscent of the Strasbourg tram – connects several major activity centers, including the expo center, university, European institutions, etc. In a few years the line will extend to the city center, main railway station, and airport. Two new regional rail stations interconnect with the tram, one requiring a funicular connection. Speaking of Luxembourgish, I love the video (here) narrated in that little-known language. (The subtitles are in French, and if that doesn’t help, the video works anyway!) Another introductory video can be found here. The cars are very sleek and modern and look like they fit perfectly with a city that combines old-world charm and ultramodern institutions (again like Strasbourg). The modern European tram combines features of what in the US we would call light rail and streetcars. Some day maybe we can have good things here too!